A manifesto is quite simply a declaration of beliefs, intentions, and opinions. The word manifesto itself is actually derived from the Latin word manifestum, which means to be made clear, or visible. So what does a manifesto have to do with spirituality? I mean, usually manifesto's are put out by governments, groups, companies or political parties to describe their goals, objectives, and beliefs. But, manifesto's are actually very powerful for those on a spiritual path too. Because manifestos communicate commitment, intentions and values. In the simplest sense, a manifesto is like a road map. It's a way to make your motives, beliefs and intentions clear and visible. 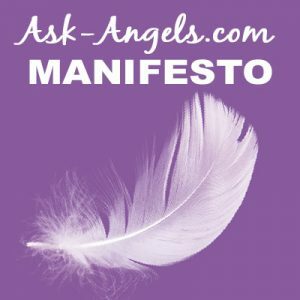 Here is the Ask-Angels.com Spiritual Manifesto! You Can Connect With Your Angels! To Nurture Spiritual Growth and Experience Greater Purpose. To Live in Alignment With Your Highest Truth. Keep Choosing Love and Happiness In The Present Moment. Know That You Are Loved, Supported and Guided. You Are Safe and Protected By Angels. The Universe is Conspiring With You! Love And Approve of Yourself. Release Fear and Return to Love. See The Light In Yourself And In Others. Love and Kindness Always Make a Difference. Here at Ask-Angels.com our mission is to help Millions of people to connect with their Angels and Teachers in Spirit so we can all enjoy more vibrant, spiritually fulfilled lives. We believe in the power of love and light, and that we can all live vibrantly well, present, aware, and filled with infinite peace, joy and love. We teach and embody living the path of the open heart. 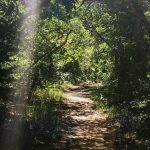 We believe in the power of living in alignment with authentic truth, with our true Divine nature, and with the highest possible potential for our lives. To support in this we share channeled angel messages and meditations, teach how to connect with angels, psychic protection, spiritual clearing, energy healing, psychic development, high vibrational living and more. We believe that with the mind there are many limitations… But with the heart, all things are possible. Keep an open heart, live in the present moment, and one step at a time, walk the Earth with love. P.S. Want a print of the manifesto? I'm considering having them printed… If you would be interested in one comment below and let me know! I would love a print of the manifesto. As I was reading this, I thought, I need this up on my refrigerator, so I can read it every day! So, yes, a copy would be awesome! 😀 Btw, I get excited to check my email each day, looking for the emails from you. They have really helped me. Yes, I would LOVE to have one. Very nice job! Haha As I was reading this I was wondering how I could print it. Would love one! This is fabulous and a great piece to have where you can see it every day!!! Thank you for sharing! Yes I would like a print out. Thank you. So beautiful, as is every one of your inspired messages. Yes, would love a copy of the manifesto. Yes I would love a print-out! Yes, I would love one! Yes, I would love a copy!! Yes, Melanie, I too would love a copy. There is so much that you can do with this beautifully written, artistic, manifesto, while spreading this inspirational message! I Love this!! Yes, I would love sprint of this. I LOVE THIS AS WELL and would love to be able to print it!! TY for all you do .. you are a light to our world!! Yes please Melanie. I would like to thank you as well for changing my life for the better and for all the love I have found here. I enjoyed this .would you please send me one of those manifestos. Thank you . Your manifesto is fantastic!! Yes please I would love a copy!! Yes Please send me a copy of your manifesto Melanie. Bless you for all you do! I love to read all about Angels it helps me feel light and I would love also to have the copy of the manifesto,please.Thank you. Definitely, I would love, love, love a copy of this! Love it! I would love a print! Yes please and thanks you ? This is what I probably need, please and thank you! Yes would like a printed copy of the manifesto…lovely affirmations! WOW…beautiful manifesto. Would absolutely love to have a copy to hang on the wall. Thank God for the gift he has given you and all of us to communicate with the Angelic Realm. Yes! I would love to have one. Awesomeness! A definite yes on getting one! Thanks Melanie. Love and light to you. Yes I need a copy pls. I would love a copy of the manifesto!! Or two! Love the way it says it all! I would love a copy! Blessings for a wonderful year sharing the Angel Messages with all of us! Blessed Be! Infinite blessings, peace, love, and joy to you! Yes please Melanie.It is lovely. Beautifully written, done & designed!! I would love a copy please. Let me know the cost for print & shipping please. Also, I want you to know that I can see why you were chosen for the beautiful gift that you have. YOU are a truly precious, lovely & radiate beauty inside & out. I am so grateful & blessed to have found you. Thank YOU for all that you do for me & the world. Just made it my lock screen wallpaper! Thank you! Yes Melanie would like a copy of this manifesto, thank you ? Please send to me a copy of the manifesto.Thanks and blessed be. Yes I will love a copy. I would like a copy of the manifesto. Thank you! I love the message in this manifesto and would like a copy to keep out as a daily reminder. Thank you, Melanie! This lifts me up today when I’m working hard at staying uplifted and positive through this longer than expected unemployment period. Thank you for all you do, God bless you.